Gather all your ingredients near the stove. Heat a wok or large skillet over medium-high heat, until a drop of water evaporates on contact. Add the oil to coat the bottom of the pan. If you need to cook any of the meat, add that now and stir-fry until just cooked, about 2 minutes. Add the garlic and cook until golden, about 30 seconds. Pour in the beaten egg and cook until scrambled. Add the rice, pressing it against the pan and then stir-frying it for about 2 minutes. Add the fish sauce, Sriracha and scallions and toss until well-mixed, about 30 seconds. Taste and add more fish sauce or Sriracha as needed. Serve with your choice of garnishes and enjoy! My verdict: Since my favorite Thai fried rice is about 3000 miles away (in Rancho Mirage, CA), this is a fine substitute! This is really just to get you started–feel free to add whatever is taking up room in your fridge. The day I made it for lunch, we had half a wonderful Thai sausage from Jacuterie, roast pork and a rotisserie chicken, so they all went in along with some broccoli, and a mushroom or two. Any vegetables can be tossed in, just be sure to add them early if they need to be cooked. I love cilantro, mint and Thai basil on top, a squirt of lime and maybe a dash of soy sauce. 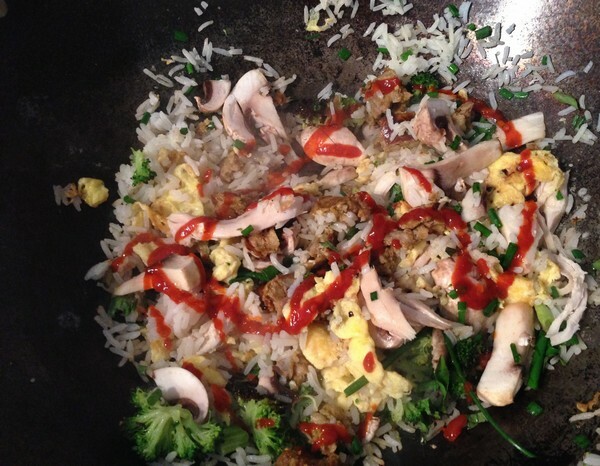 And don’t let the wok scare you; if it’s well seasoned it’s super easy to clean! 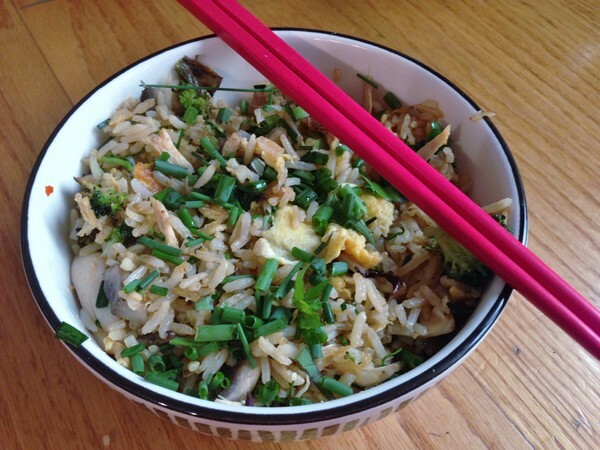 What would go in your fried rice? 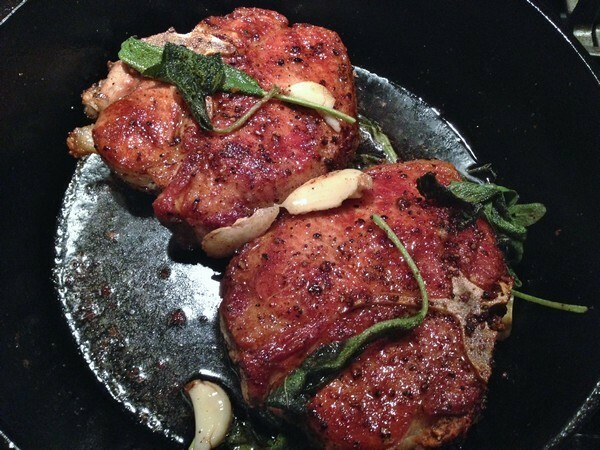 Will These Be Your New Favorite Pork Chops? A good looking pair of pork chops caught the Accidental Locavore’s eye the other day, and seemed to be just the thing to put a recipe from bon appetit titled “Your New Favorite Pork Chops” to the test. It requires a little hands-on attention, but you can just do what I did and park the iPad close to the stove to answer emails between flipping chops. Serves 2 or more depending on the size of your chops. Heat oil in a large skillet over medium-high. Season pork chops all over (including the sides) with salt and pepper. Cook pork chops until bottom side is golden brown, about 1 minute. Turn and cook on other side about 1 minute before turning again. Repeat this process, turning about every minute, until chops are deep golden brown and an instant-read thermometer inserted into the thickest part registers 135°, 8–10 minutes (cooking time will depend on thickness of chops). Remove pan from heat and add sage, garlic, and butter, smashing garlic into butter. Tilt skillet and spoon foaming butter and drippings over pork chops, making sure to baste all over. Transfer pork chops to a cutting board and let rest at least 5 minutes (pork will come to 145° as it sits). Serve whole or sliced with the juiced spooned over and enjoy! 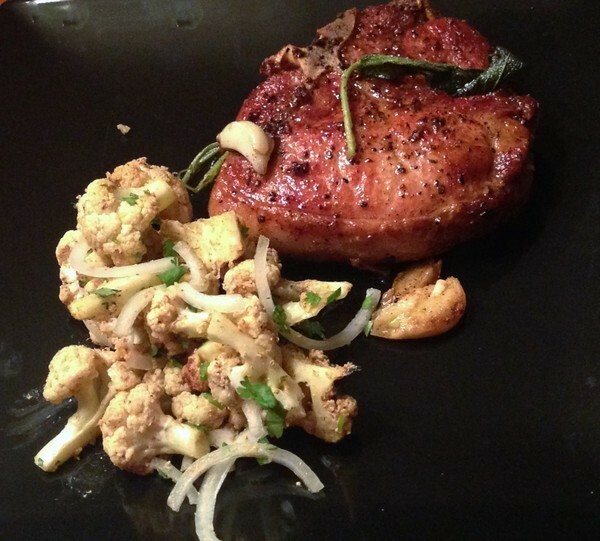 My verdict: While I’m not ready to say these are my favorite pork chops, they were awfully good! Done in a cast iron skillet, they were nicely browned, and perfectly cooked, yet still juicy and delicious (even without being brined, which I considered doing). 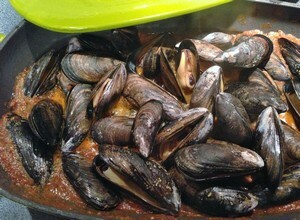 The next time I make the French style ones (which are my personal favorites), I’m going to try cooking them like this (I did and they were great!). And even though they say you’re not supposed to turn steaks more than once, if no one is paying attention, I may give that (or some lamb chops) a try. Preheat oven to 400°F. In a medium bowl, whisk together 2 tablespoons oil, vinegar, soy sauce, 2 of the grated garlic cloves, ginger, Sriracha and 1/4 teaspoon salt. Place pork in a large Ziploc bag and pour marinade over, tossing to coat. 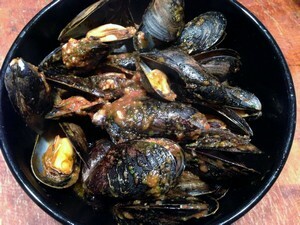 Marinate for 30 minutes at room temperature. In a small bowl, whisk together remaining 1 grated garlic clove, fish sauce, lime, honey, chile pepper, peanuts and 1 tablespoon water. Set aside. Meanwhile, heat a large skillet with 2 tablespoons oil over medium-high heat. Remove pork from marinade (saving the marinade) and sear on all sides until lightly browned, about 3 minutes per side. Turn tenderloins onto their fourth side and add broth to pan. Transfer skillet to oven and roast pork, basting occasionally, until internal temperature reaches 140°- 145° about 10 to 13 minutes. Transfer pork to cutting board and let rest 5 minutes, and reserve skillet. Add reserved marinade to the skillet and cook over medium heat, stirring and scraping up the browned bits, until thickened to a pan sauce that coats the back of a spoon, about 5 minutes. Remove from heat and whisk in butter. Taste and adjust seasoning. 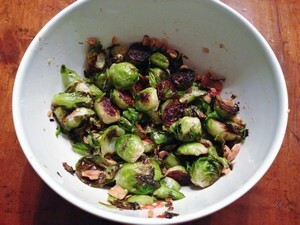 Serve the sliced pork with the pan sauce and the Brussels sprouts, sprinkle with mint, and enjoy! 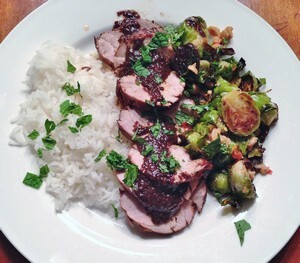 My verdict: I’ve made this twice for two people, using the whole recipe for the sauce and vinaigrette, but with only one pork tenderloin and fewer Brussels sprouts. It’s a really good dish, but I’m not totally convinced that the two components need each other. 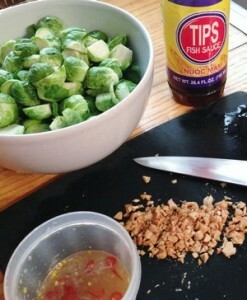 Brussels sprouts with fish sauce (and cilantro) are a surprisingly great combo and the peanuts add a nice crunch. The pork with the marinade/sauce is really good and would be fine with any number of vegetables like bok choy or spinach (especially if you’re not a sprouts fan). If you have time (or remember), you can marinate the pork ahead of time—just refrigerate it.